When Gene Autry was looking to move his team out of Los Angeles and into the suburbs in the early 1960s, his first option was Long Beach. Autry liked the location, midway between Los Angeles and Orange County, with easy freeway access. The plan was to build a stadium on property that is now El Dorado Regional Park. Negotiations between the Angels and the city progressed until hitting what appeared to be a minor snag: What to call the team. The city demanded the team be called the Long Beach Angels. Autry, thinking the name sounded too minor league, insisted on the Los Angeles Angels or the California Angels. The city held out for Long Beach . . . and that was the deal breaker. Herald-Examiner Collection; Los Angeles Public Library. What’s important to note about Autry’s original desire, as to the location of this Long Beach stadium, was the freeway access. Of course, anyone who has attempted to exit off the Cerritos/Spring Street exit off the 605 Freeway on a busy weekend afternoon when there’s an event at El Dorado Park might beg to differ with respect to the freeway access. 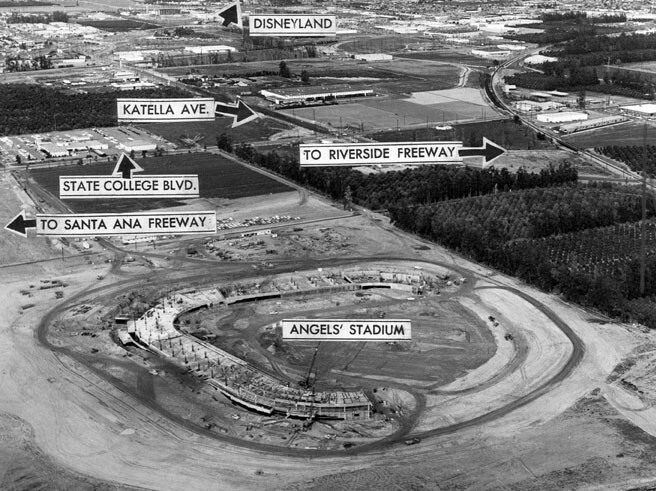 But moving to Anaheim, where Disneyland had been established 10 years before, allowed the Angels to try to build upon the idea that there could be other destinations in Southern California that didn’t have to be in Los Angeles. It’s also ironic to note that one of the original sites considered for Disneyland was the land later to be so attractive to Dodger owner Walter O’Malley. The “Los Angeles Football Stadium”: lost in the hoopla over AEG’s Farmer’s Field in downtown Los Angeles, does this location offer possibilities for baseball should Moreno insist upon moving the Angels out of Anaheim? If Walt Disney, Walter O’Malley, and Gene Autry could all see the wisdom of trying to get as easy freeway access for their attractions as they could, why is it that Arte Moreno, in addition to his geographic illiteracy, flunks history class as well? Does the “Grand Crossing” stadium location work for a potential baseball team? 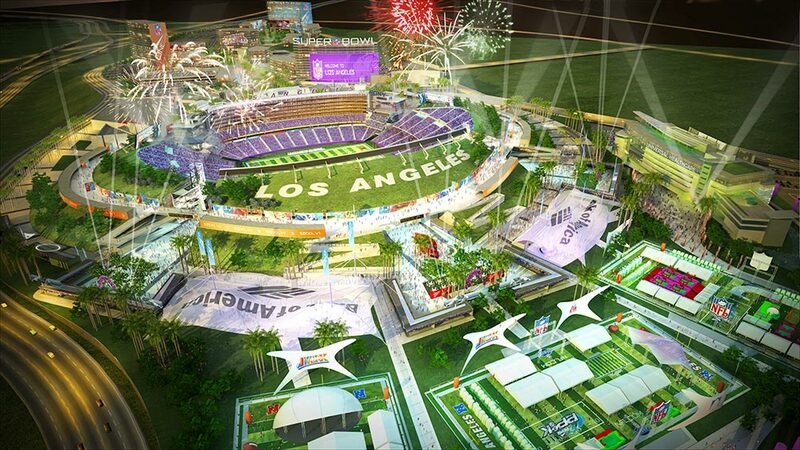 I have no idea if Ed Roski and his people behind the scenes in trying to attract notice of the NFL to bring a football team back to L.A., have even given a single thought to bringing baseball instead, in this instance Arte Moreno, to their stadium plans. But admittedly, the idea has its appeal in terms of the property in place, the freeway access, and opportunity for Moreno to continue to build upon his long term plan of “branding” the Angels’ place upon Southern California. But in his obsession with L.A., Moreno is not just missing the forest for the trees, he’s missed the off-ramp–or rather, he’s stuck on the off-ramp, of the 110 Freeway traveling north, at rush hour, while trying to get into this downtown stadium he apparently wants. For all of his supposed marketing genius, how he’s misread the Southern California sports market is maddening, not unlike how Donald Sterling failed to take advantage of an opening that Anaheim offered his Clippers when the Ducks became the first tenant of the Anaheim Arena (now the Honda Center). Arte Moreno is stuck in the traffic of his own self-aggrandizement, not trusting that, perhaps, the Cowboy, Gene Autry, knew what he was doing with his team in the first place.